A new version of Toshiba’s popular NB305 netbook will launch with Intel’s new DDR3-enabled N455 Atom processor along with 1GB of 1066MHz DDR3 RAM. The Toshiba NB305-10F has been spotted on the official Toshiba France website complete with a list of specs. Other specs remain the same. It will come with a 10.1-inch (1024 x 600) display, 250GB HDD and Windows 7 Basic. The exact launch date for the new NB305 is unknown but it will launch with a price around the €350 mark. Déjà vu .. !! 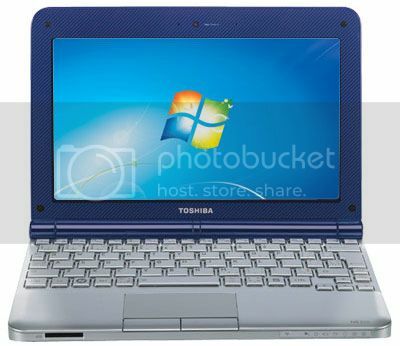 Toshiba has very few models but all best netbooks. It’ll be interesting to see this next line. Normally I see brands like Asus, Samsung and Acer wanting to be the first to release any new technology but their models may or may not be the best of the lot. Toshiba seems not to be in a hurry but they come in time and dish out a super product just like they did with NB205 and NB305 earlier and now am guessing this too will be just one model but a neat product (Its still a NB305). But somehow I feel the specs for the sake of newer technology are becoming enhanced so Toshiba may need to also think on the lines of a premium netbook or affordable still but with better specs with better resolution, Win7 (Touch UI capable), Optimus, etc … something along the lines of Asus Eee PC 1215N (Dual Core, ION2). I don’t think anyone is ever going to be 100% satefsiid with anything Microsoft, but I AM going to pay the price wor win7 simply because I love it already and I am not the type who wants to deal with the hazzle of a pirated OS.